Teton Gravity Research, leader in action sports media, recently released a list of what they consider the best ski camps for women on the planet. The women’s ski clinics that made the cut, have offerings from January to August (Yes August!) and focus on improving your skills in a low pressure environment with other ladies. 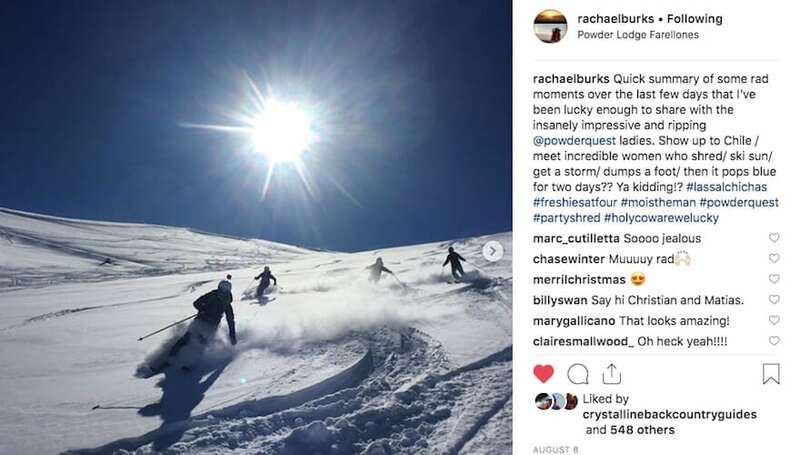 We are honored PowderQuest’s ski camp for women in Chile, developed with pro skier Ingrid Backstrom in Chile every August, made the top 10. Focused on off-piste and backcountry skills in some of the most beautiful locations in The Andes, the camp is run with a maximum of only 6 women and 2 guide/coaches. The smallest camp on TGR’s hot list. Check out the video with Ingrid, the lucky camp guests and beautiful southern Chile. Sessions have recently been lead by pro skiers Jess McMillan and Racheal Burks while Ingrid stays home to start her family in the beautiful state of Washington. TGR’s selection of ladies only mini-ski vacations range from weekends in the high mountains of Colorado, Montana, Utah, Nevada, Jackson Hole and Whistler, Canada to week long international clinics in exotic locations such as the Andes of South America. The “best of list” has a clinic for all different budgets and skill levels, in addition there are camps for a variety of skiing styles including moguls, half pipe, slackcountry, backcountry awareness and yes, some camps offer mechanized accessed backcountry like heli-skiing. To learn more about skiing with Ingrid, Racheal or Jess in August, check out this summer’s schedule via the button below.